You know that time when you pull that great espresso and spin your milk the best you have done all day. Then you line up your pouring jug and drop that first bit of silky, smooth, velvety, white, lactose full goodness into your espresso. As your cup fills you slowly drop the spout of the jug so that it almost kisses the crema and as if it was magic your milk begins to appear. You begin to swing your jug left to right left to right like a pendulum. Your rosetta commences. The lines start to take shape so you slowly reverse your jug whilst continuing to rock it back and forth. You reach the top, you wait and then flick through. Performing the best bloody rosetta you have in your whole life, you throw down your steam cloth in total satisfaction. With a puffed up chest you plate this masterpiece and hand deliver your pride and joy to the customer yourself. You strut slowly back to your post, chatting to other customers on the way, thinking ‘I was born for this!!’. As you come around the corner to your machine, you see the customer, it’s the one that was lucky enough to receive your pride and joy. They say “Hey, there is something different about the coffee today, this tastes really weak! !’Been there? Sometimes we get too focused on trying to perform a new ground breaking pattern in your customer’s beverage. Instead we should be focusing on how to maximise flavour in the cup. That’s when you gotta put your P’s into practice! Pace, Position and Proximity are somewhat known as the three P’s for considered pours. We add ‘Prep’ and call it the 4 P’s. If you nail these points, your beverage won’t just look the goods, it will taste the goods too. Swirl that espresso. In this prep stage, you want to break up those clumps of crema, turning it into a flat, even canvas. Tilt the cup slightly to be in the correct starting position. Hold the jug about 7-9 cm above the the cup, pouring the milk into the centre of the cup. Pour slow and steady. Here you’ve got to be nailing it with proximity, position and pace. When your cup is approximately 3/4 full gently move the jug closer to the cup, slightly speeding up your pour. Make sure your still in the middle! Your cup should now be full. Slow down that pour, raise the jug about 3 cm and flick the jug back to horizontal. This technique will encourage your milk to stay in the centre of the cup and keep all that crema on the outside. Resulting in a flavourful cup. 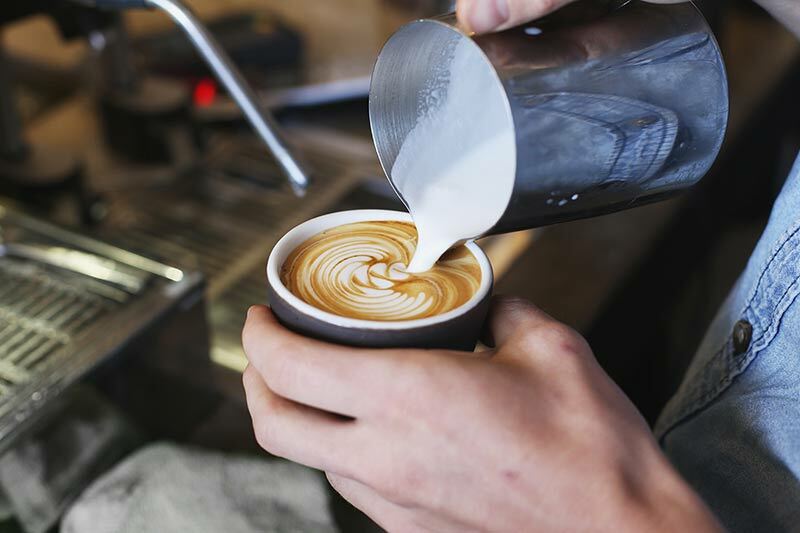 Latte art is great but not at the risk of washing out flavour. So remember Prep, Position, Proximity & Pace. Oh and a 5th ‘P’ – Practice!